Winter Ice-Capades continue. Yesterday afternoon had some sun that turned the parts of the driveway and road into slush that weren't covered by shade, enough to be able to get out a little bit. Today, the water that has melted has formed another layer of ice, looks like another good day to STAY HOME unless it's an emergency. I remind that my primary issue locally about the Somervell County Hospital District dba Glen Rose Medical Center is that Somervell County taxpayers are spending money at Pecan Plantation Medical Center, which is NOT in this county but Hood County; Hood County has its own hospital district for which residents pay NO taxes, yet Somervell County pays to fund a clinic that no one can just walk into and use because it's behind a gate. I think this is not only the wrong thing to do but believe if challenged in court, the Glen Rose Medical Center would be told to cease doing that immediately. I am personally not one of the people driving the petition to dissolve the Somervell County Hospital District, although I not only agree with doing so, I have been one of the many volunteer people, over 900 taxpaying citizens, who helped to get signatures for the initial petition, or signed it by going into a store. It's also interesting to me that since I decided to join the many others who also wanted to help, I met quite a few other people who felt as I did, who I had not previously known. But the bottom line is that I am simply someone with an opinion and not one who is actively involved in the intricacies of it, regardless of what stage is it in. Really??? Why does David Dewhurst want to diss south Texans by comparing the border to a war zone? Republicans. Ugh. Hah. 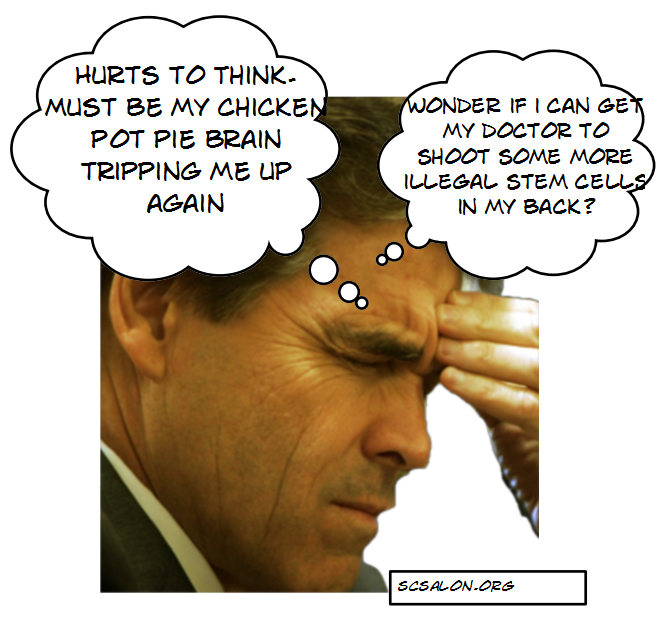 GOP seriously thinks Rick *Oops* Perry can help them rebrand. Except he couldn't show up there because of the bad ice storm in Texas. Republican rejection of Medicaid is depraved. The refusal of Republican states to accept Obamacare's Medicaid expansion surely ranks as one of the most sordid acts in recent American history. The cost to the states is tiny, and the help it would bring to the poor is immense. It's paid for by taxes that residents of these states are going to pay regardless of whether they receive any of the benefits. And yet, merely because it has Obama's name attached to it, they've decided that immiserating millions of poor people is worth it. It is hard to imagine a decision more depraved. So this is why so many gay republican congressmen stay in the closet. Ooops. Passenger falls asleep on plane, finds out he's locked in. That Scary Monkey Sock Toy! TSA KEEPS PASSENGERS SAFE!!!! Tech Giants push back against NSA spying. Oh, sure, they did it as long as nobody knew. Class issues?Sure. McDonalds doesn't pay squat to its employees, who are also quite likely on govt programs like food stamps just to make a living, but tells their corporate execs to be sure to tip the au pairs. Fast-food giant McDonald's has committed another employee advice blunder, listing pricey suggestions for tipping au pairs, personal fitness trainers and pool cleaners on its worker resource website. What if your name is Sheffield? Incidentally, while I really like J D Sheffield, I decided not to be on his distribution list due to his being Christmas-centric, or as I like to call it The War on Happy Holidays. I suppose on the one hand it doesn't matter since Christmas is a secular holiday, but would it kill people to be INCLUSIVE? Speaking of Separation of Church and State. Here's what happens when you insist on putting religous symbols of a particular sect at a public entity like a courthouse. Festivus Pole at Wisconsin courthouse. The Oklahoma State Capitol's Ten Commandments monument is being challenged in court by the Oklahoma chapter of the American Civil Liberties Union. Brady Henderson, legal director for ACLU Oklahoma, told the AP: "If the Ten Commandments, with its overtly Christian message, is allowed to stay at the Capitol, the Satanic Temple's proposed monument cannot be rejected because of its different religious viewpoint." Although a hundred and forty-one million people bought things in stores or online, exceeding the 2012 figure by one per cent, they spent $1.7 billion less than they did last year. Why didn’t the new, extended Black Friday weekend achieve the desired results in consumer dollars? According to the Times, “Walmart and Target both trimmed their yearly forecasts recently, citing economic factors like slow wage growth, unemployment and sliding consumer confidence.” In other words, as Steven Greenhouse reported in a bleak post-Thanksgiving article, too many Americans now work low-paying jobs—for example, stocking inventory and ringing up merchandise in big-box stores like Walmart and Target—to have enough purchasing power to boost sales. Americans are too poor to stimulate economic growth.